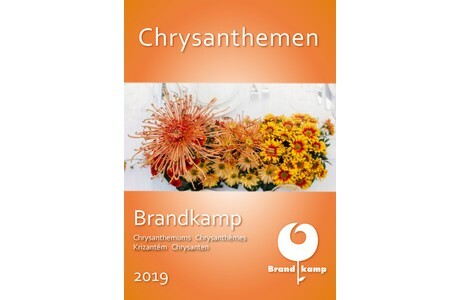 German breeder and propagator Brandkamp just launched its 2019 Chrysanthemum catalog. In this catalog, all kind of Garden mums, pot-chrysanthemums, ajanthemums, cut-chrysanthemums, outdoor cut chrysanthemums and cut flowers seedlings are presented. Click here to view the 2019 Chrysanthemum catalog. Brandkamp was and is a pioneer in the breeding of Multiflora chrysanthemums. "'Bran-Multiflora-Line' is a synonym for quality. Our range consists almost just our own varieties. Most of them are suitable for all pot sizes and uses." The product range of their pot chrysanthemums is dominated by their own pot varieties, the Island - Line. "Perfect match varieties are one of our main goals. Please pay attention to our Pemba series, that´s available in eight colors." When you combine Chrysathemum and Ajana, you get Ajanthemum. This variety is known for its round growing habit with many flowers. "On top of that, it is slow blossoming, has a long sale period and is a good addition to the Pot-Chrysanthemum assortment." Cut chrysanthemums is an important part of Brandkamp's range for almost 60 years. "In addition to traditional, disbud varieties, we offer our customers a constantly updated range of spray chrysanthemums in all possible colours and flower shapes. Discover our innovations in our Brandkamp-breeding called AsiaLine. The share of own varieties is increasing steadily in the cut mums as well." Nowadays, only at a few young plant producers one can find the traditional culture of the outdoor cut chrysanthemums, but at Brandkamp it is maintained. "Also in this segment we enrich the ever-popular range with our own breeding." 2019-04-24 "A suitable Petunia for all places in the world"